:The super heroes sticker book is a fun collection of colorful stickers that every child from the ages of 5 to 8 is sure to love! 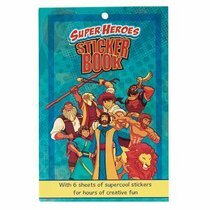 This sticker book includes 6 sheets of stickers of cartoon biblical heroes with action bubbles and fun shapes. These stickers help your children bring the Bible stories to life and interact with the characters in their own creative ways. This sticker book is a great way to introduce your children to and remind them of the real life super heroes â€" the characters of the Bible! About "Super Heroes Sticker Book"